In the past, the popular Tactical Research TR360 boot received rave reviews from U.S. Army personnel. This boot has been updated with the new TR350 Men's Khyber II Hot Weather Mountain Hybrid Boot. Designed for the hot weather mountainous terrain of Afghanistan, this boot has a lightweight breatheable upper and 2 instep vents for promoting cooling and air circulation. An aggressive Vibram tread design keeps you on your feet on both loose and rocky terrain. A heel slider aids in stopping you down mountainsides. While a toe bumper helps when climbing over obstacles. 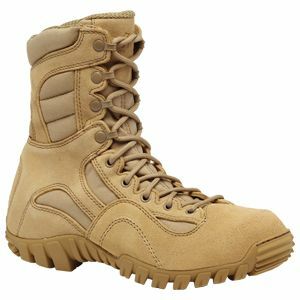 This low profile boot is ideal for soldiers engaged in agile tasks when a full size combat boot is not required. However the TR350 boot maintains its durability and toughness through double and triple stitching at all the major stress points. This boot is AR670-1 compliant. Good solid boot. But the sole is too hard and make my heels hurt. Also, they were slightly small so I had to exchange for the next size up. I received these boots 3 days after ordering and they fit great out of the box. They are higher quality than I expected based on the leather, stitching, and hardness of the sole. I really like the sole pattern which has numerous knobs on the sides for grabbing on to walls, trees, or whatever. I expect to get several years out of these boots. Very satisfied with my purchase and recommended them to a few of my friends that have bought them. I bought these Khybers for general use on the weekends since I do a lot of camping, hiking, and geocaching. Initially there was a slight pinch in the left ankle when I first got them this worked its way out after a couple of days. These boots are extremely comfortable now and I like the fact they are lightweight. The Khybers impressed me so much I bought the Sage Green version. They did run slightly large for me when I ordered my regular running size. Overall a decent boot and I've owned a few different brands. I chose this boot because of the good reputation Belleville boots have for their comfort and durability. These Khyber boots weren't as comfortable as some other boots I've owned. Maybe because this is more of a tactical style boot. The insole is quite stiff and provided very little cushioning. These boots get a bit uncomfortable after a few hours where a lot of standing, walking. I plan to switch out the factory insole for a more cushioning gel one. I got these for SWAT training. I didn't get a chance to break them in. I literally put these the day of my 3 week training course. They felt comfortable and did well outside doing field searches. No blisters or problems. In fact I forgot I had on a new pair of boots by the end of the first day. So they do what they're supposed to do. I transitioned from work boots to these lighter tactical style boots and they feel great. I came off a pair of Wolverines which were good quality and durable but they were heavy. I'm a wiring contractor and so I'm bending down and on my knees a lot. These boots are much more comfortable since they're lighter and more flexible when working. They're very quiet I noticed and not as clumbsy as my older work boots. Good comfort even in 100 degree weather.